We think every home to be its owner’s kingdom, and a monarch would settle for no less than the best, neither should you! If we are detained for any reason, the locksmith will call you and not keep you waiting and wondering. 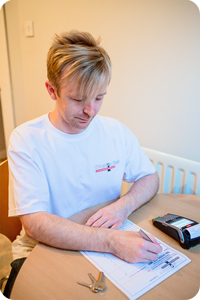 For insurance compliance and peace of mind, we offer £25 Security Checks. We will listen and discuss with you what your needs are and provide you with an explanation and quote for work and parts. We will ask for your address and post code as well as a contact number in the event we need to reach you. We give you an honest, truthful ETA. You will know it is us when we show up in the Kingdom Keys van, wearing our logo work wear on. If the work deviates from what we have quoted, before we do any work, we discuss the changes with you. We do not leave until you are 100% satisfied with the work. We then provide you with a detailed company headed receipt with a year guarantee. We will always ask for a testimonial when we complete our work. We leave you with 2 business cards, one to keep and one to give as a referral. Why should you pay more for a job because it took us longer than expected? You should not have to. 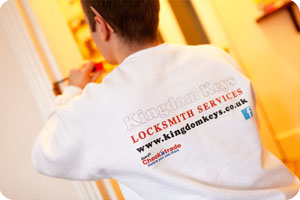 Unlike many locksmiths, we do not charge an hourly labour rate. Our labour rate is not only fixed, it is a fair and honest price. We believe that if your door is open but not in working order and can be repaired without parts you should only be charged a fixed labour rate for that job. For things like a jammed door, we charge a fixed rate to open the door, no matter the length of time it takes us. Should the door require parts to keep it from jamming again, you will be given a fixed price for the labour to fit the part as well as a fair and honest price for the parts. We believe in a fair and honest way of running our locksmith business. 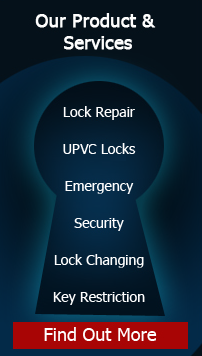 We pride ourselves in providing quality locks with fair pricing. 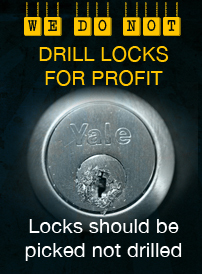 Unlike some companies who will sell you a cheaply made lock just to undercut their competitors. For your convenience we accept cash, debit or credit card payments. Our goal at Kingdom Keys is to provide the best customer service because we rely on our customers’ exceptional feedback and their referrals. We always ask for a referral when our work in complete, you can view our customers’ feedback on our website. Call the company you know and can trust for ALL of your locksmith needs. Kingdom Keys is registered and verified through CheckaTrade™ and the CRB, Criminal Records Bureau.